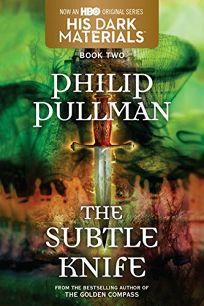 Philip Pullman's His Dark Materials trilogy now appears in sophisticated trade paperback editions, each title embossed within a runic emblem of antiqued gold. The backdrop of The Golden Compass: His Dark Materials, Book I sports a midnight blue map of the cosmos with the zodiacal ram at its center. The Subtle Knife and The Amber Spyglass carry similarly intriguing cover art, and all three titles offer details not seen in the originals: in Compass and Knife, for example, Pullman's stamp-size b&w art introduces each chapter; Spyglass chapters open with literary quotes from Blake, the Bible, Dickinson and more.